And we had a lovely time with friends who dropped by for the whole North American Halloween experience. It was brilliant. 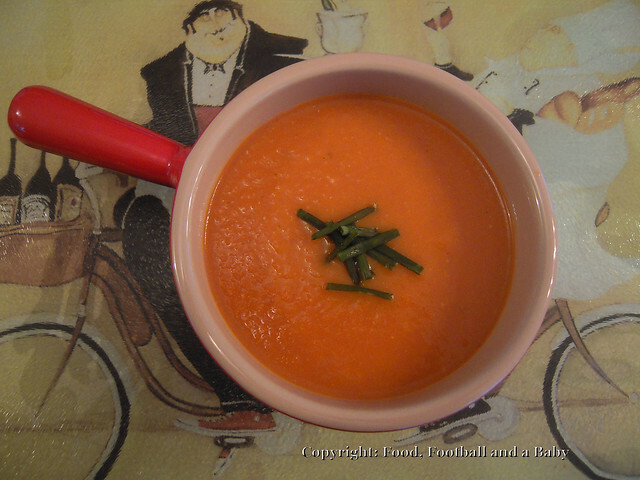 Anyway, in keeping with the whole gory theme, I decided to post this tomato soup I made a week or so ago. I can't stand the cold, so for me winter is just an excuse to make warm comforting soups. This one is the easiest one ever and cobbled together with ingredients we all tend to have at home, and tastes delicious with a crumble of herby goat's cheese melted on top. This does have a very pronounced and strong tangy, tomatoey taste, so season heavily if you want it less tomatoey. It stays vegan, unless you stir in some cream and the cheese at the end, which you can do, if you wish. In a heavy pot, heat the oil, then add the onion, celery, garlic and thyme. Cook for around 5 minutes, not letting the onion colour too much. Stir in the chopped tomatoes and tomato paste. Cook on a low heat, stirring ocasionally for around 15 - 20 minutes, until the tomatoes are well mushed up. Add the stock and simmer on a low heat for another 5 minutes. Transfer to a blender and blend till smooth. Season well to taste. Reheat, till just steaming and serve with a sprinkle of chives. If using, stir in the cream and return to the heat. Do not boil the soup, just heat till steaming. Crumble the goats cheese on top and put under the grill for about a minute till the cheese is bubbling. Serve with a sprinkle of chives. I am liking blood and gore!